THE SKINNY: This is an oil-free eye make-up remover for waterproof mascara that is meant to condition your lashes while it cleans them. The blue-hued goo is fairly easy to use, just like any other makeup remover. But it didn't leave my lashes feeling particularly clean, I still woke up with mascara residue under my eyes the following morning. And a few times I used it, my eyes felt dry and a little irritated the next day. 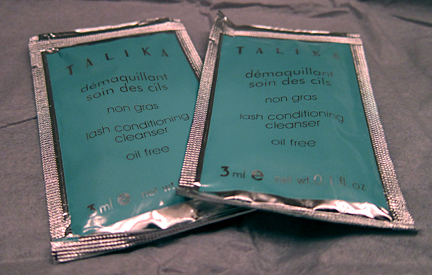 CHECK IT OUT: Talikia says this product is good for people with sensitive eyes or who need to strengthen their lashes.